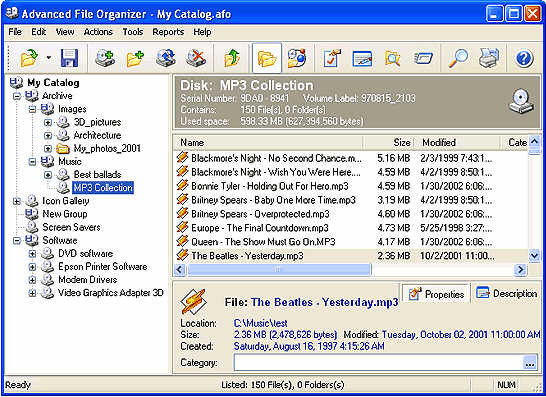 Advanced File Organizer is a cataloger for all disks, which are recognized by your Windows system. This includes diskettes, hard disks, CDs, DVDs, Memory Stick card and any other storage devices. Advanced File Organizer can be your DVD organizer or CD organizer, if you want. It helps to create a catalog of your disk collection. Customizable Structure of the Disk Catalog --- You can define necessary categories for disks and files. The categories can be hierarchical. The category tree can be easily re-organized using 'Drag-n-Drop'. There is a special function to export the category tree for later reuse in other catalogs. Powerful Search Function --- Find files and folders using wildcards. Advanced search options: file size, date limits, and descriptions. Export search results to Excel via the Comma Separated Values format (*.csv). Flexible Browsing --- You can browse the hierarchical tree of disks, files and folders that looks exactly the same as in Windows Explorer, or you can sort files by custom categories you assigned to them (such as "Documents", "Applications", "Files created by Paul" etc.). This feature lets you quickly find files of a certain type regardless of their physical location. Your Own Searchable Remarks --- You can add comments to every file, folder, disk and category. Powerful Report Generator --- You can create and print out several kinds of reports, including brief and detailed information on the cataloged disks, search results, list of existing categories and detailed report. Support for RAR and ZIP Archives --- Advanced File Organizer recognizes archives in popular RAR and ZIP formats and handles them as folders: you can view the list of files contained in the archive, add comments and descriptions to them and find archived files using the Search feature. CDDB Support --- When you add an Audio CD to your catalog, Advanced File Organizer can retrieve the list of tracks and other information contained in the Internet CD database. Compact Database --- Advanced File Organizer doesn't use any database engines. The database generated by Advanced File Organizer is very compact and will be fully compatible with Advanced File Organizer doesn't use any database engines. The database generated by Advanced File Organizer is very compact and will be fully compatible with future versions.future versions. Asmw PC-Optimizer pro - optimize system and tune up window and window XP performance. Advanced Access Password Recovery - recover your lost password for Microsoft Access 95/97/2000/XP database.